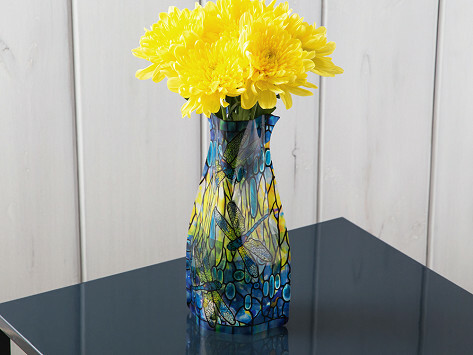 A thin but strong, flexible, expandable, transparent, glossy vase that won’t chip, scratch, break, or fade. I have ordered this product before. Never disappoints. My friends absolutely loved these! The Myvaz vase is a great alternative to the traditional vase. Myvaz has an uncanny ability to be stored flat right in a drawer then blossom to full size when water is added. You can collect several and continuously change the vibe of your environment. With Myvaz, you can simply open the plastic sleeve and fill it with water, then use it indoors or out—arrange them along tabletops, outdoor patio tables, or in bathrooms. The vibrant, fade-resistant patterns will add a burst of color that compliments your floral arrangement. Modgy = Modern + Edgy. Their goal is to comes up with fun, edgy solutions to everyday problems. These vases—with their unusual silhouette and collapsible design—align perfectly with that goal.